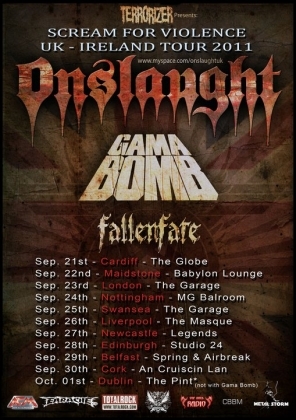 Festivalphoto spoke with Sy Keeler and Andy Rosser-Davies from Onslaught just before their London show on their UK tour. Festivalphoto: Earlier this year you released your latest album, Sounds of violence. Can you tell us a bit about the album? Sy: The album in general, or the aftermath, or a bit of both? OK, the album is produced by Jacob Hansen who is a Danish gentleman and he has produced a fantastic album for us. We have how many songs on there? Andy: Ten originals - eight songs, one outro one re-record and a cover version. Sy: It was a great working environment - we went to Denmark to record, no distractions, the nearest bar was ten kilometres, not that we drink much anyway. Yeah it was a great experience, in the middle of the countryside, our transport was bicycles and we went for some very nice rides but ultimately the whole recording session was very relaxed, there was no pressure, apart from the..I say there was no pressure but I had a week to do the vocals, in fact I did the vocals in five days. The finished tracks we've got on the album, the cover version and one of our old songs I did on the Sunday virtually before we left. It was very relaxed and I was very happy with the way things went for me for sure. All the guitars were done prior to the session - the guitars were recorded in South Wales, sent over in files and he re-amped them and did his magic, and ultimately an incredible album, its Heavy Heavy Heavy but the clarity of the thing is fantastic. We always, or Nige particularly always set a benchmark for sound - Machine Head's "Burn my eyes" which was and probably still is head and shoulders above a lot of other metal albums as far as sound, and that was the benchmark and I think we surpassed that so I can quite happily say that "Sound sof violence" has surpassed the Machine Head album as far as sound goes. It's powerful, heavy, awesome. The aftermath of the album; of course we've been touring all over the world and continue to do so. This is the start of quite a busy winter for us, after the UK tour we're off to South America, back home for a little while, and still to be confirmed we'll be touring Europe with a big American band and then in the new year we're off to India which is quite exciting. The album's done really well, we've had great press, plenty of airplay both here in Europe and more so in America - the Americans are really hungry to get us over there but at the moment its the logistics, the financial logistics you know - everythings got to be right, we've got to keep everyone happy, not just us, we've got to make sure the promoters dont lose money...when the circumstances are right we will go over to the states. Yeah its been fantastic. Festivalphoto: You covered Motorheads "Bomber" on the album, with Phil Campbell and Tom Angelripper guesting - how did that come about? Sy: Phil Campbell, Jeff our bass player knows his son. We toured with Motorhead back in '87 when Phil was in the band, and we had a pretty good relationship with him back then and as Jeff knew his son it was suggested that he approach Phil through his son and see what he said. He said "Yes absolutely", and gave his services free of charge. Andy: He had some cupcakes and four cans of cider. Sy: There you are, it wasnt free of charge. Cakes and cider, what a combination, but yeah he came down to the studio in South Wales which Andy runs and put his guitar track down. Tom, we were thinking who can we use and had a list of names, approached a few and they weren't interested and our manager said "what about Tom?". They were in the studio right at the same time as us, in Germany, and of course these days its so easy to record and then email over some files so that's what we did. Our manager called their manager and Tom said yes of course he would, and of course Tom's a hge huge Motorhead fan so fr him to get his voice on a Motorhead song for him was awesome. So hats off to those guys - they did a great job. Festivalphoto: How would you compare the new album to your previous albums? Andy: Each recording is in context though - you can't seesaw back and forth, each album is different in approach or sound I guess but its still the same band, still the same motivation, and I think the band's always tried to make the best record it can you know. Whether it's improved song writing, improved production, performance, guitars, anything, it's still the same driving force to make the best record you can, and even with the "sounds of violence" now, we've just started writing the new album for next year, and the approach is still "right ok that was that mark, how are we going to better it, how are we going to make a better album", and I think that's why each record sounds slightly different - a bit of movement on from the preceding one. Festivalphoto: The band formed in the early 80s then split in 1991 before reforming in 2004. What prompted the reforming after so long? Sy: Well the albums were still selling. We came across the albums selling online - and had been re-released without our knowledge or any consultation with us and we investigated who was doing it, and Plastichead were the ones doing it through Blackened and apparently they were selling quite well without any publicity at all. So we thought, well the albums are still selling, there's obviously an interest there, lets give it a try, get back together and see where it leads basically. When we got back together, the first meeting we had, we all agreed it couldn't be a reunion based on the first three albums - we had to have new material, so we spent a year - the best part of a year writing songs for "Killing peace", at the tail end of which we started to go out on the road and tour so we did quite a few gigs before we recorded "Killing peace" so yeah its really because the albums were still selling and there was a market there so we thought "lets try it - lets give it a go guys". We might have found three or six months down the line that we don't get on or things weren't working out at which point we'd have disappeared back into obscurity again but no it's been fun, really good fun doing it and hence us being here now - if its not fun there's no point in doing it. Festivalphoto: You played Wacken earlier this year - how was that? Sy: That was very very very good. We played in one of the tents and it was absolutely heaving in there, absolutely heaving. All these shows really take me by surprise - take us all by surprise. Sy: You turn up at a festival, not quite knowing what to expect and we went to the stage and it was absolutely heaving, the noise was incredible. Andy: Wacken was incredible wasn't it because it was in a really big tent, huge tent with a barrier kind of splitting the crowd up and we went in there and thought "ok its going to be strange, not sure how many people are going to show up you know" then we got ready, and as soon as the intro tape came on we walked out on stage and it was like "okay" there were just people - thousands of people - it was great, really enjoyed that, they were just going crazy. Festivalphoto: You've played quite a few festivals including Wacken, Bloodstock, Hard Rock hell. Sy: Yeah we've played festivals all over the world - Sweden Rock, Lorca rock in Spain...They were the same, we'd hit the stage not knowing what to expect, and they were all phenomenal. Andy: I don't think you can have a favourite because all the festivals, the experience is slightly different I guess or the situation is slightly different but the experience is the same you know, and I think it's so pleasurable as a musician to perform in front of as many people as you can you know - it's just a great buzz I guess, really really good fun. When you walk out on stage and, Bloodstock for me in particular we kind of walked on stage, had a look round and we'd got a huge backdrop and then turned round and all you can see is people going crazy and its a case of "right better be on the ball today, I better play it right". Good experiences, really good experiences. Andy: We don't like to talk about technical problems..
Andy: Yeah we do, but that's the problem with festival shows with such a quick turnaround, you've just got to play through it - work through it you know. Simple as. Sy: Small intimate venues are great if they're packed, hot and sweaty absolutely. It doesnt change the way we perform though, we still give absolutely everything whether we perform (and we have done) in front of 5o or 60 people or we're in front of ten thousand. Andy: It's the same show, same attitude, same vibe wherever - we go up there and do what we do you know. Sy Obviously we feed off what's presented there for us and if it is like Wacken was, particularly amazing then I think that spurs us on to the next level again. Andy: But equally, we played in Maidstone yesterday and during the last song I went on to the front plinth of the stage and I was there doing the last solo, and I can remember as I was trying to play I was thinking "this is awesome" because all I can see is people headbanging in front of me, heads going everywhere and you just think this is awesome and you dont get that from big gigs because you've got the distance there. It's the same show but I think they're enjoyable for different reasons. There was one small club show we played in Belgium on the docks and it particularly sticks in my mind. We showed up and this place kind of looked like a squat and we're thinking this can't be good and it was right on the docks. So we soundchecked and there was a good PA there, good lights, and then eventually the place started to fill up and it was so full in there that people were basically coming to the front of the stage like a conveyor belt, they were climbing up onto the stage, stagediving off and being carried over the top of the crowd to the back and it was awesome - really good gig you know. So they're all good for different things. Festivalphoto: What bands do you like to listen to? Sy: Andrew you go first. Sy: We're all aware of the new generation of thrash around the world, you've got to keep up, got to know what's expected of you by listening to other bands, and my favourite band at the moment is Opeth. I'm a huge prog fan, being an older generation and raised on the '70s music. The new Opeth is an incredible album, Heritage, and that's really what I listen to, Led Zeppelin, Deep Purple, Rainbow, The Gathering - a Dutch band, very good Dutch band, Pink Floyd, an eclectic mix, I think its a healthy mix, you should never be ashamed to say what you listen to, I don't give a damn, I don't judge people on what they listen to, it comes down to what you like as a person. Andy: If its good music it's good music no matter what really. You've got to have a healthy respect for any kind of performer or any talented individual.